PONTE VEDRA BEACH, Fla. — Paul Tesori detached the yellow flag at the 18th hole and carried it with him as he walked off the Stadium Course at TPC Sawgrass. For Tesori, this was more than just a championship souvenir. It was part his childhood and could be his most treasured piece of golf memorabilia. 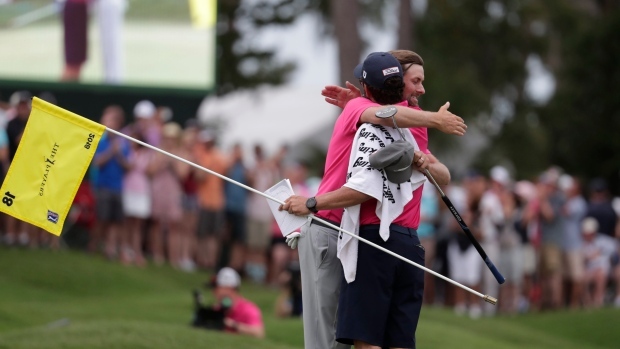 Tesori, the caddie for The Players Championship winner Webb Simpson, grew up down the road from Sawgrass and has played the course more times than anyone in the field. When Simpson won by four strokes Sunday, Tesori got the first and maybe the longest embrace. "This means about as much as anything could," Tesori said later. Tesori picked up golf at a young age thanks to the influence of his grandfather, who was a starter at the nearby Ponte Vedra Inn & Club for 30 years. His first golf tournament as a fan was The Players in 1977, when the event was still played across the street at Sawgrass Country Club. He figures he's played the Stadium Course more than 700 times, first getting on at age 9 because his grandfather was the course's first superintendent. He's so entrenched with the area that he and his wife, Michelle, run the Tesori Family Foundation, a non-profit organization founded in 2009 to help those in need in Northeast Florida. Following the birth of their 4-year-old son Isaiah, who has Down Syndrome, they expanded the organization to add programs for kids with special needs. After Tesori dropped Simpson's bag, he picked up Isaiah and carried him around during interviews and for part of the trophy presentation. That was the easiest part of Tesori's day, even though Simpson started the final round with a seven-shot lead. "I've been fortunate enough to be part of a lot of leads, but I've never had anything close to this," Tesori said. "It was stressful to be honest with you." Relief set in at the final hole, and Tesori planned to enjoy the night with family and friends. Simpson surely will be nearby. The two are close friends who worked through "two and a half years of miserable putting" to get to this point. "Paul has been just a great friend through all this, a great co-worker," said Simpson, who won the 2012 U.S. Open with Tesori on his bag. "Through that, I expected him to be frustrated at times, and he never was. He never got frustrated. He stayed positive on my worst days. He would try to give me a pep talk. I think to go through that, you need someone more than a caddie, you need a friend, and he definitely was that for me." Jason Day grimaced and then grabbed his left shoulder after an approach shot at No. 16 in the final round. But Day said the recurring pain was nothing to be concerned about. "Every now and then, it happens where my shoulder ... feels like it pops out, but it's like more of a sting," Day said after finishing 13 under and tied for fifth. "I don't know if it's from because I've had back issues and it's gone from my back to my shoulder now." Day said he felt the same pain at Bay Hill in nearby Orlando in March. He added he does between 30 and 45 minutes of exercises daily in hopes of staying loose. "It's been bugging me pretty much the whole year," heh said. "It's been pretty sore. Over the last couple weeks, it's actually been really good. I'm always pretty diligent about doing the exercises, so every week it's gradually gotten better and better. So hopefully if I keep on top of it will just slowly go away." Steve Stricker entered to play in the AT&T Byron Nelson next week. He also entered the Regions Tradition, a major on the PGA Tour Champions. He said earlier in the week he had until 3 p.m. Monday to decide. Stricker and his family were headed to Alabama for the first senior major of the year. "I'm not putting that good," Stricker said after a 73-70 weekend put him just outside the top 20 at The Players Championship. "I hit some squirrelly shots that I've been slowly working myself into. I'll go try to work at it for four rounds at the Regions Tradition and then go play Colonial." He also knows the Greystone golf course in Birmingham. Stricker tied for 13th in the Tradition last year.